E ARC courtesy of the author. Connor and his friend Pilaf (really Olaf) have a hard enough time dealing with bullies like Geoffrey at their school, but when a mysterious man starts stalking him, his sister Melanie and his friend Lexa, things get weird and scary fast! Terrible storms start popping up, and Connor finds that his anger can often storm out of control-- he didn't really mean to set Geoffrey's pants on fire, did he? It is soon revealed that Connor, Lexa and Melanie all are Magi (warriors for the Light)who powers have just Kindled, and they are in danger because the forces of the Dark are trying to get them. Luckily, most of their teachers are also Magi, and are working hard not only to keep them safe, but to teach them survival strategies and lots of magic! After a few large mishaps, there is a "Parent-Teacher Conference From Heck", and the parents decide that they don't want their children to have anything to do with the Light. Then they take them to Disneyland. Silly parents! That won't work. Soon, Connor is kidnapped and at the mercy of Lady Nightwing, who is doing awful experiments on children who are on the cusp on Kindling. Will his teachers have the power to save him? Will Melanie and Lexa also be at risk? More importantly, how will all of them make sure that the gateway to the Otherworld won't stay open and make it easy for the Dark to come into our world and wreak more havoc? Strengths: Funny, funny lines! Any book with the first line "Connor Del didn't mean to set anyone's gym shorts on fire" will be a popular book. I also thought that the world of magic was realistically and clearly defined. Using a school setting more than home worked well in this instance. The magical names and activities were all coherent and cohesive, which is a big plus, since so many magical realism books struggle to get this right. There is a nice blend of action and strategy. Very pleased. Weaknesses: This is published by a small press (Sweetwater Books, Cedar Fort, Inc.) and might be hard to find, although paperbacks are available. This book could have used a bit more editing-- with some more polish and attention to pacing, etc., it would be absolutely brilliant. 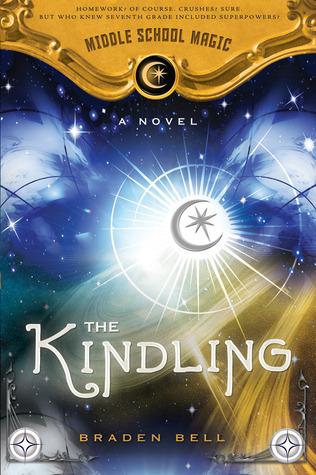 Sign into Goodreads to see if any of your friends have read The Kindling.